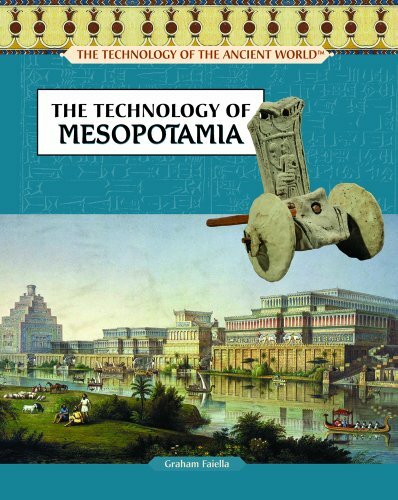 The Technology of Mesopotamia by Graham Faiella is a children's/young adult work detailing the inventions and innovations of the people of Mesopotamia. It is one title in the series The Technology of the Ancient World brought out by Rosen Central of the Rosen Publishing Group, Inc. Beginning with an introduction to the cradle of civilization, the book easily transitions through the rise of the cities, modes of transportation, agricultural developments, the invention of writing, and the Mesopotamian contribution to mathematics. A timeline is featured at the back of the book and resources for further reading are also included. The work is impressive in the number of advances in technology it addresses in its brief 48 pages and the photographs, which accompany the text on each page, are well chosen and complement the topics under consideration. The Royal Standard of Ur, for example, is displayed across two pages with text detailing where it was discovered, the materials from which it was made, and its significance to the people of the city of Ur. The chapter on writing accurately relates the development of the written word in Sumer and features photographs of cuneiform tablets and cylinder seals. The section relating to further reading on the subject lists well known authorities such as Jean Bottero and Samuel Noah Kramer and another page lists museums a reader may contact or visit for more information. An excellent introduction to the subject for young readers or for anyone who looking for easy access to the topic. Highly Recommended. Mark, Joshua J. "The Technology of Mesopotamia (Technology of the Ancient World)." Ancient History Encyclopedia. Last modified February 04, 2014. https://www.ancient.eu/review/46/. Mark, Joshua J. "The Technology of Mesopotamia (Technology of the Ancient World)." Ancient History Encyclopedia. Ancient History Encyclopedia, 04 Feb 2014. Web. 18 Apr 2019.